Some pretty cool stuff in this store…and for a layman like me, the term “antiques” is somewhat misleading, because in my mind, that word means old stuff that only appeals to the appraisers on the antiques show on PBS – you know, like a bookshelf from 1792 that was built by the 2nd cousin of Ben Franklin. But stores like Homestead Treasures have much more “collectible” stuff than “antique” stuff – cute Americana trinkets, magazines from the 1950s, Coca-Cola memorabilia, and tons of other funky-kitschy stuff. 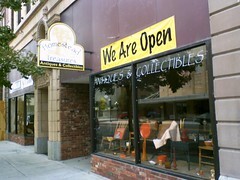 Check out Homestead Treasures at 320 Central Avenue, and tell ’em Dave sent you!